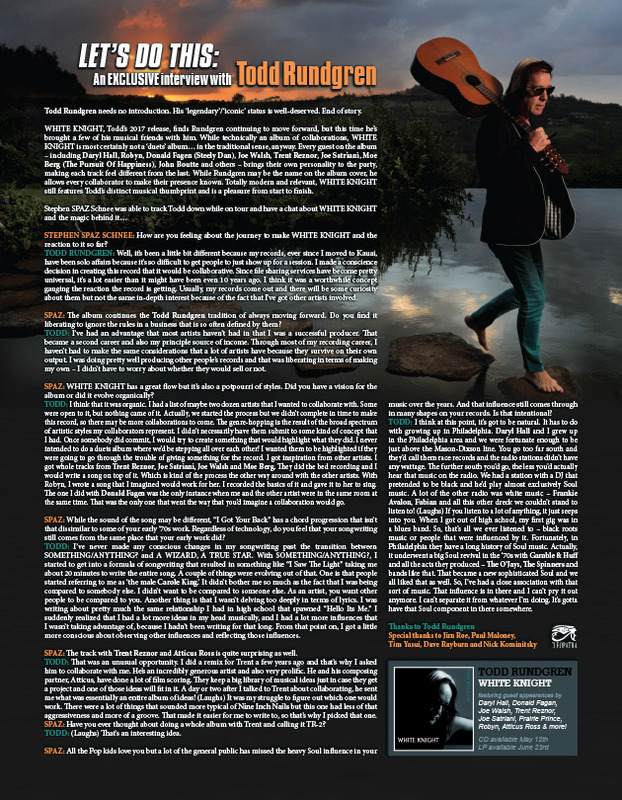 Discussions Magazine Music Blog: TODD RUNDGREN: An EXCLUSIVE interview! Todd Rundgren needs no introduction. His ‘legendary’/‘iconic’ status is well-deserved. End of story. 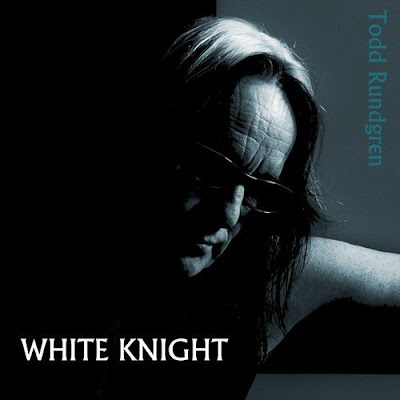 WHITE KNIGHT, Todd’s 2017 release, finds Rundgren continuing to move forward, but this time he’s brought a few of his musical friends with him. While technically an album of collaborations, WHITE KNIGHT is most certainly not a ‘duets’ album… in the traditional sense, anyway. Every guest on the album – including Daryl Hall, Robyn, Donald Fagen (Steely Dan), Joe Walsh, Trent Reznor, Joe Satriani, Moe Berg (The Pursuit Of Happiness), John Boutte and others – brings their own personality to the party, making each track feel different from the last. While Rundgren may be the name on the album cover, he allows every collaborator to make their presence known. Totally modern and relevant, WHITE KNIGHT still features Todd’s distinct musical thumbprint and is a pleasure from start to finish. STEPHEN SPAZ SCHNEE: How are you feeling about the journey to make WHITE KNIGHT and the reaction to it so far? 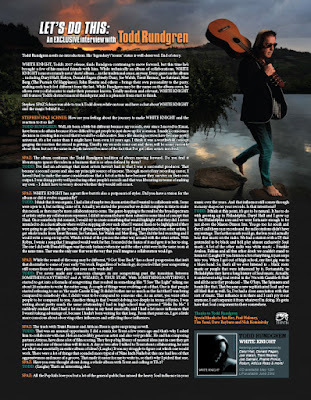 TODD RUNDGREN: Well, it’s been a little bit different because my records, ever since I moved to Kauai, have been solo affairs because it’s so difficult to get people to just show up for a session. I made a conscious decision in creating this record that it would be collaborative. Since file sharing services have become pretty universal, it’s a lot easier than it might have been even 10 years ago. That was the first thing that made it different. But I became dependent on other artist’s schedules. It became a real scramble sometimes to get some people to realize that I had deadlines and deliver for me. I think it was a worthwhile concept gauging the reaction the record is getting. Usually, my records come out and there will be some curiosity about them but not the same in-depth interest because of the fact that I’ve got other artists involved. 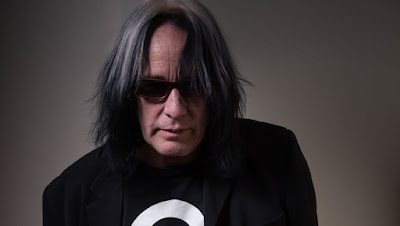 SPAZ: The album continues the Todd Rundgren tradition of always moving forward. Do you find it liberating to ignore the rules in a business that is so often defined by them? TODD: I’ve had an advantage that most artists haven’t had in that I was a successful producer. That became a second career and also my principle source of income. Through most of my recording career, I haven’t had to make the same considerations that a lot of artists have because they survive on their own output. I was doing pretty well producing other people’s records and that was liberating in terms of making my own – I didn’t have to worry about whether they would sell or not. My relationship with the labels in that regard was always a little hot and cold. If I was producing something that was successful in the album market, everyone was happy with me. If I did one of my own crazy records with no consideration in how successful it would be, there would be great consternation as well. SPAZ: WHITE KNIGHT has a great flow but it’s also a potpourri of styles. Did you have a vision for the album or did it evolve organically? TODD: I think that it was organic. I had a list of maybe two dozen artists that I wanted to collaborate with. Some were open to it, but nothing came of it. Actually, we started the process but we didn’t complete in time to make this record, so there may be more collaborations to come. The genre-hopping is the result of the broad spectrum of artistic styles my collaborators represent. I didn’t necessarily have them submit to some kind of concept that I had. Once somebody did commit, I would try to create something that would highlight what they did. I never intended to do a duets album where we’d be stepping all over each other! I wanted them to be highlighted if they were going to go through the trouble of giving something for the record. I got inspiration from other artists. I got whole tracks from Trent Reznor, Joe Satriani, Joe Walsh and Moe Berg. They did the bed recording and I would write a song on top of it. Which is kind of the process the other way around with the other artists. With Robyn, I wrote a song that I imagined would work for her. I recorded the basics of it and gave it to her to sing. The one I did with Donald Fagen was the only instance when me and the other artist were in the same room at the same time. That collaboration came about through a social occasion. He was on the island and we went out to dinner together and I just popped the question. I told him that I had an orphan track that I was probably going to leave off the record unless he wanted to listen to it and come up with an idea. He started sending me titles. Then we had a couple of face to face sessions that didn’t last more than an hour each, he recorded his vocals and we had it done. That was the only one that went the way that you’d imagine a collaboration would go. SPAZ: You are one of the few artists that can wring emotion out of modern technology. Do you find that your musical ideas are inspired by the changes in technology or do you manipulate technology to fit your ideas? TODD: I got into the sound sculpting aspect of it. I record in a way that a lot of people would consider backwards and it came from having my own studio early on. When I had to record in other studios, I couldn’t afford to go in with fragmentary ideas and waste a lot of time trying to figure out what the end product is supposed to be, because the meter is running. It can get pretty expensive. So, after SOMETHING/ANYTHING?, I decided I would build my own studio and that would give me all the time that I needed to push the envelope in a sonic sense. Ever since then, I’ve always had my own studio. I build the tracks essentially before I ever write the song. The tracks suggest to me where the songs should go. I may have a place holder lyric or an idea of what the subject matter might be but very rarely have I written out the whole song – like I did in my early days – and learnt how to play it, then go into a studio and perform it in the traditional sense. I write the words and melodies at the very last minute. I think that may help with that emotional aspect of it. SPAZ: While the sound of the song may be different, “I Got Your Back” has a chord progression that isn’t that dissimilar to some of your early ‘70s work. Regardless of technology, do you feel that your songwriting still comes from the same place that your early work did? TODD: I’ve never made any conscious changes in my songwriting past the transition between SOMETHING/ANYTHING? and A WIZARD, A TRUE STAR. With SOMETHING/ANYTHING?, I started to get into a formula of songwriting that resulted in something like “I Saw The Light” taking me about 20 minutes to write the entire song. A couple of things were evolving out of that. One is that people started referring to me as ‘the male Carole King.’ It didn’t bother me so much as the fact that I was being compared to somebody else. I didn’t want to be compared to someone else. As an artist, you want other people to be compared to you. Another thing is that I wasn’t delving too deeply in terms of lyrics. I was writing about pretty much the same relationship I had in high school that spawned “Hello Its Me.” I suddenly realized that I had a lot more ideas in my head musically, and I had a lot more influences that I wasn’t taking advantage of, because I hadn’t been writing for that long. From that point on, I got a little more conscious about observing other influences and reflecting those influences. It has been self-conscious but I do a lot of research to see what it is that people are listening to. I did that especially with STATE and GLOBAL. And with EDM, which I was comfortable with because I was doing that sort of crap with INITIATION, where me and Roger Powell would just set up a giant wall of synthesizers and start improvising. There’s still a little bit of the essence of EDM on the current record. I like to stay current in terms of my influences as long as it is something that I could do without self-consciousness. The only thing I can’t do without self-consciousness is write a Country song! (Laughs) So, I’m not going there! SPAZ: The album is going to introduce the audience to some lesser-known artists like John Boutte. Was that your intention when putting this album together? TODD: John Boutte has been a friend of mine for a while. He’s a New Orleans fixture. Whenever he goes out to play, the place is crammed. At the same time, he’s a friend of mine so I couldn’t leave him out! (Laughs) In some cases, the end results were surprising. The thing I did with Joe (Walsh) surprised both of us. You wouldn’t listen to it and suddenly think, “Oh, it’s Todd Rundgren and Joe Walsh.” You’d have to see the credits to know that. SPAZ: The track with Trent Reznor and Atticus Ross is quite surprising as well. TODD: That was an unusual opportunity. I did a remix for Trent a few years ago and that’s why I asked him to collaborate with me. He’s an incredibly generous artist and also very prolific. He and his composing partner, Atticus, have done a lot of film scoring. They keep a big library of musical ideas just in case they get a project and one of those ideas will fit in it. A day or two after I talked to Trent about collaborating, he sent me what was essentially an entire album of ideas! (Laughs) It was my struggle to figure out which one would work. There were a lot of things that sounded more typical of Nine Inch Nails but this one had less of that aggressiveness and more of a groove. That made it easier for me to write to, so that’s why I picked that one. SPAZ: Have you ever thought about doing a whole album with Trent and calling it TR-2? TODD: (Laughs) That’s an interesting idea. SPAZ: All the Pop kids love you but a lot of the general public has missed the heavy Soul influence in your music over the years. And that influence still comes through in many shapes on your records. Is that intentional? TODD: I think at this point, it’s got to be natural. It has to do with growing up in Philadelphia. Daryl Hall and I grew up in the Philadelphia area and we were fortunate enough to be just above the Mason-Dixon line. You go too far south and they’d call them race records and the radio stations didn’t have any wattage. The further south you’d go, the less you’d actually hear that music on the radio. We had a station with a DJ that pretended to be black and he’d play almost exclusively Soul music. A lot of the other radio was white music – Frankie Avalon, Fabian and all this other dreck we couldn’t stand to listen to! (Laughs) If you listen to a lot of anything, it just seeps into you. When I got out of high school, my first gig was in a blues band. So, that’s all we ever listened to – black roots music or people that were influenced by it. Fortunately, in Philadelphia they have a long history of Soul music. Actually, it underwent a big Soul revival in the ‘70s with Gamble & Huff and all the acts they produced – The O’Jays, The Spinners and bands like that. That became a new sophisticated Soul and we all liked that as well. So, I’ve had a close association with that sort of music. That influence is in there and I can’t pry it out anymore. I can’t separate it from whatever I’m doing. It’s gotta have that Soul component in there somewhere. SPAZ: What’s next for Todd Rundgren? TODD: We’re on the road pretty much for the rest of the year. I’m going to try to continue this collaboration thing. When an album comes out, it isn’t necessarily the end of it. Under the White Knight heading, I can keep collaborating and putting stuff out, which I hope to do. We’re also in the early phases of trying to put together a Broadway production that utilizes my music as the principal score. Those kinds of things can take a long time but we’ve got some serious people involved and so we expect that something is going to happen.